Great read! Look forward to the sequel. Just re-read this great book for the second time and enjoyed it almost as much as the first time! I’m a little behind in my reading so better get cracking on the sequel! Loved the island and the characters and even though I’m rocker-bound, I was climbing and swimming with them all. Thank you again for this adventure of body and soul. Hi, Sheila! Love hearing you are re-reading Stranded–a wonderful compliment! I read it so many times when writing and editing it that I still can’t stand to read it another time, LOL! Best wishes on enjoying the sequel, Forgotten! I really liked this book. I counldnt put it down. I felt like I. Was on the island too. How can I read the next book? Have just finished Stranded. Wow! What a great book. Such a good story and so well written. The characters were very transparent with their good qualities and flaws and the unexpected twists and turns kept up my interest all the way through. This was one of the best books I have read since I got into reading “Christian fiction”. Well done! I’d be interested to know if this was your first book (if so it is incredible that you have created such a wonderful book on your first go) and how the two of you work together in your writing. God bnless you for enriching my life through Stranded. Thank you, Ross, your words are a great encouragement! Yes, this is our first book, and we put in a lot of time (as in years) learning “how to write” before we felt Stranded was ready to publish. Basically the way Don and I work together is that he comes up with the original story, and I write it and develop the characters and theme. Since Don is a Marine Corps reservist, you can find a plethora of marvelous details from his survival training in Stranded! The sequel will be out no later than Christmas. LOVED, LOVED, LOVED this book!!! Not often to I find myself looking for someone to tell them they’ve GOT to read this book….. This was one of those times!! By the way, did I say how much I loved this book!! One of the best books I’ve read in a long time…. so many twist and turns… surprises around every corner….totally couldn’t wait to finish it yet tried to slow down because I didin’t want it to end…. Great job! Keep ’em coming!! More big hugs to you, Brenda! 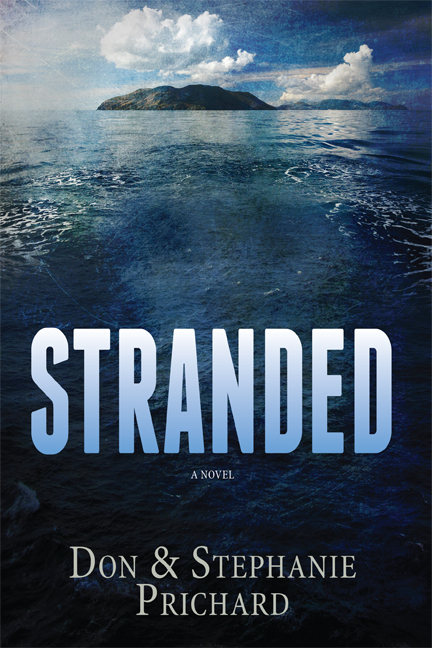 I am really looking forward to reading the next ” Stranded” book. Thoroughly enjoyed reading the first one. Keep up the good work. LOVED this book! Great job! Really looking forward to the sequel. LOVED this book, cant wait for the sequel!! What a great read! Get some more books out there soon. Action, reality, and provoking heart-checks. Yes. I look forward to more. As for me I am a mssnry in an area of the world where I have seen too much of the results of war and a good escape into someone else’s action is great. Thanks for making your book available online. I can’t get them any other way. Thanks, Lisa, for your enthusiasm! Where are you a missionary? I couldn’t put it down. Literally stayed up all night reading! Loved it & am looking forward to much more!! Big hug and sweet dreams to you, Ruby! Hi, Judy! The sequel should be out by November ~ December at the latest. Big *hug* for your anticipation! Just read it the second time loved it as much as the first time! A second reading is a high compliment–thank you, Mary! Looking forward to the sequel! Great book! Thanks, Adam! We’re looking forward to launching the sequel within the next few months! Ha ha ha, Robert ~ You made me laugh! I cannot believe this book. It was so fantastic. It kept me so interested. I have not read a book that kept me so enthralled in years. I thank the Lord for the talent He has given you. God bless you. Oh, wow, thank you, Beverly! Very, very encouraging words! Big *HUG* to you! Do you have other books out or do you plan on writing as another one along the same lines? If you do please advise me I would love to read more of your work. I loved this book! Life has unpleasant things in it. I appreciate that you didn’t write an unrealistic book that makes life look lily white. The book is amazing and I am so looking forward to the sequel! Thanks, April! Big *hug* to you! Advice well-taken, Sandy! Sorry about all the vomitting, LOL! I chuckled at your “Swiss Family Robinson/Robinson Crusoe” comment, as sometimes Don & I think of Stranded as “Swiss Family Robinson meets Jack the Ripper”! I was wondering if you’re still working on a sequel to Stranded? Looking so forward to one! Bless your heart, Joanna, we are almost done (do I hear cheers?)! The sequel will be out in November! Amazing story! I was pleasantly surprised to discover that this was a Christian novel and want to thank you for that. Can’t wait to read the sequal. Donna, we’re so delighted at your joy that Stranded was a Christian novel! Big HUG to you! We anticipate the sequel will be published in November. I really liked this book. I had trouble putting it down. Looking forward to the sequel.. I just finished my third reading of Stranded and it was just as exciting as the first time! Excited to learn there will be a sequel. Eager to read it!! Three times ~ wow, Debbie! Three hugs for your enthusiasm! Loved, loved the book. Looking forward to the sequel!!!! I really liked how real all the people were in the book. Their struggles with their faith and God was what we all go through one time or another. But God shows His love and forgiveness to all over and over again!! Praise His Name!!! Thank you, Pat, for appreciating God in our book! Yes, praise His name! Is the sequel still coming out this month? Hi, Brenda! Yes, as of yesterday, we put the sequel up for pre-order, which will be delivered on 11-25. Thanks for so faithfully waiting for it! I just pre-ordered mine. Can’t wait to get it. Thank you, Sandy! Big *hug*! I got the sequel and can’t wait to read it! I’m rereading the first one though because it’s been so long since I’ve read it. I’m really enjoying it again! I remember that somewhere you had a map of the island but I can’t find it. Can you please tell me where to find it? Blessings to you both! Hi, Val! The map is one of the tabs at the top of our website, donandstephanieprichard.com. Do you see it? I just finished Forgotten! AMAZING!! I didn’t see how you could top Stranded but you did it! I loved how you worked the love of God and Jesus into the story and reminded me that forgiveness is for my sake not my enemies sake and that He can change even the most evil heart. Please tell me their story is not finished. Do they get together and take care of Emilio’s son? So many loose ends please tie them up for us. Love your writing and your books. Thank you for blessing me with them! Thank you, thank you, for writing this encouraging note to us, Jane! I’ve been worrying about how Book 2 would go over, so you have my heart rejoicing with your wonderful response! Yes, there will be a follow-up story, but, sigh, it will be at least a year. We won’t start on it until after the Christmas holidays. Oh my goodness!!! Just finished Forgotten!!! There HAS To be a Book #3!!! Shhhhhhhh, Suzanne, keep it quiet–there is a Book #3 planned … but you know it will be awhile! I love your eagerness, Gail! We aren’t abandoning Jake, Eve, and Crystal–there will be a sequel! 🙂 We’ll start after the holidays. Loved it. I read STRANDED months ago. Loved it and when I found the sequel I couldn’t wait to read it. FORGOTTEN was just as great. Such an awesome reminder of God’s grace and mercy He freely offers to man. I can’t wait to see how life unfolds for them as they continue to live their lives. What fun to discover the sequel, Rebecca! So glad you loved it as much as Stranded. 🙂 🙂 🙂 Sometimes sequels bomb, and we’ve been holding our breath to see how Forgotten was received. Absolutely loved this book , wished I had read Stranded first .s. Oh dear, Sharon, I hope the order didn’t mess up a good read! Just finished Stranded and felt like I’d just had to say goodbye to my best friends. Yay, to find out about the sequel. God bless you guys richly for providing such a great Christian read, what a blessing I got from it. Enjoyed the lessons too. Can’t wait to ask my boss to buy it too! Big Love, from Cheral from South Africa. Big hug to you, Cheral, for your sweet comment! Wonderful to know our novels are getting beyond U.S. borders! Thanks, Caryl, I hope you’ll enjoy it! Loved the books. When will we see book 3? Hi, Mike! Thanks for loving our books! The third book is going slower than we thought, so it looks like early 2018 is the forecast for now. Yep, big sigh! Wow. Just Wow! Easily one of the best books I’ve ever read! Every single page was amazing and thrilling! You have such a talent and are being used of God! How I wish I could afford your sequel! One day soon, I hope. Keep on writing 🙂 God bless you both! Thank you, Lauren, for loving our book so much! We want it to glorify God, and your praise does just that! A big HUG to you! Wow….great book!!! I could hardly put it down! I too felt like I was on the island…..and crawling through that hideous tunnel……being squeezed by that wretched python…..such vivid imagery. Looking forward to reading the sequel. LOL, Teresa, I can tell you have a great imagination! We love writing for readers like you who totally experience the book! Big (but not python size) hug to you! Hi Stephanie and Don, I just finished reading Stranded and absolutely loved it. I couldn’t wait till I had a chance to read! The storyline was great and totally different from any book I’ve read. Your descriptions of events, smell, emotions, etc. were so detailed it was like watching a movie! Ya’ll make a great team and keep up the good work. Hi, Irma! What HUGE encouragement your words are! A big hug to you for taking the time to write us! Bless your heart, Maureen, we are working on that book right now! We anticipate its publication in 2018. Best two mystery/romance books ever, so glad a number three is in the works. Thank you, Greta! Big hug to you! I did not know a number 3 was in the works. That is good to hear. I think I might need to read the second one again to be reminded of what happened. The old memory isn’t what it used to be. I have enjoyed these books. Hi, Sandy! Oh ya, I know what you mean about the old memory not being what it used to be! Yes, Book #3 is in the works but is sorta limping along right now. It will be out in 2018, but no idea at this time as to what month. Both books were an absolute delight to read, and I am thrilled that there will be a Book 3! Thank you for weaving Biblical truth throughout such exciting stories. I was challenged in my Christian walk by the spiritual struggles and victories of the characters. May God bless, guide, and give you wisdom as you continue your writing. Thanks for your kind words, Beth! We love it when readers are challenged by the Biblical truth woven into our stories. Our hope and prayer is to glorify God through our books, and we appreciate your encouragement. Just finished Stranded, well done! I didn’t know that the book had a spiritual undertone but was drawn in because of it. Thank you for a look into Jake’s, Eve’s, Betty’s and Crystal’s ordeal. Most of us won’t find ourselves Stranded on a remote island but may in our lives feel as if we are. So human, so in need of God. Great story! Any idea when the finale is coming out…..? Well, ouch, while it IS under way, it’s been slow going. 2017 has turned out to be a busier year than we expected, so I’m afraid we’re looking at publication sometime in 2018. I know, bummer! LOL! Thanks for your (im)patience! Big hug while you’re waiting! Kathi, so happy you love our books! Plans are for Book 3 to be published sometime in 2018. Loved both books and can’t wait for the sequel. Is there any way to be notified when the next book will be out! It took me awhile to get back to it. But it was gripping from start to finish. It had some unexpected twists. A little mystery, intrigue, touch of romance, a touch of fsith goes a long way. Loved how you brought it all together. A big hug to you, Sandra, for the encouraging words! Can’t wait for book #3 …. Merry Christmas to me!! And me … if I come through, LOL! WOW! I could not put this book down! It had everything I want in a book. The characters were ‘real’, the storyline attention grabbing and the writing amazing! Stranded is a book I will certainly recommend and I will have no hesitation in buying these authors books. Love, love, loved it! Disappointed to find ‘Forgotten’ not available for purchase! Whaaaaat? Look for its full title, Forgotten: A Novel. Hugs. Is there a third book coming out? The first two books were awesome! I liked how scripture was added throughout the story. Hi, Steph! We are writing a third book but the going has been mighty slow. Our hope is to publish it by Christmas. So delighted you found our first two awesome–big hug to you! Found these two books just recently. So enjoyed reading Stranded and Forgotten, Thank you for writing such good Christian books. Look forward to reading third book in this series. Thank you for your kind words, Martha. They give my heart joy!